For years salads have had a pretty bad rap. Notoriously thought of as “diet food”, they’re often made with iceberg lettuce, mushy tomatoes, and store-bought croutons drowned in a bottle of ranch dressing. No thank you! It’s time for a salad shake-up. With an abundance of fresh produce, lean proteins, complex carbs, and innovative dressings to choose from, salad-making has become somewhat of an art form. So if your green bowls are in need of a serious boost, here are some pro tips for creating the ultimate Naked Salad. Whether it’s spinach, romaine, or butter lettuce, vary up your greens and always make sure they’re washed and dried. We use a salad spinner to get rid of excess water, which makes a huge difference in the texture and ensures your salad doesn’t become a soup. If you don’t enjoy a particular vegetable, don’t eat it, even if it’s the ‘superfood du jour’. It may sound simple, but when you choose healthy veg that you really love, you’ll enjoy your meal far more. And isn’t that what life’s all about? Get creative when it comes to preparing your add-ins. For example, shred carrots, peel cucumbers, and julienne radishes for a colourful meal that satisfies both the eyes and your palette. And don’t stop at just veggies. Fruit can be the secret ingredient for creating a salad you’ll love. Don’t use bottled salad dressing. They’re often filled with chemicals, preservatives, salt, and unnecessary saturated fats, which can easily be eliminated by making a simple vinaigrette. 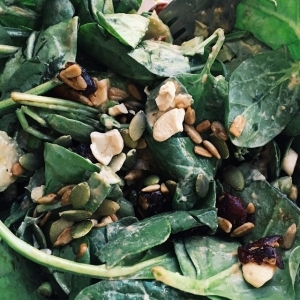 In less than a minute, you can have a delicious dressing that’s chalked full of healthy fats. Here’s what you do, just mix 1 part vinegar with 2 parts oil. Our favourite pairings include balsamic vinegar + extra virgin olive oil, grapeseed oil + apple cider vinegar, and avocado oil + red wine vinegar. If you have a little extra time, chop in some garlic, shallots, and a squeeze of lemon to really kick it up a notch. 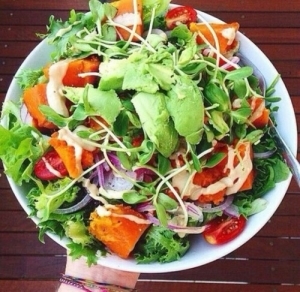 Adding lean protein and complex carbohydrates to your salad will keep you feeling fuller for longer. It’s also a great way to use leftovers from last night’s dinner. Some of our favourites include avocado, chickpeas, tofu, black beans, boiled eggs, grilled chicken, or prawns. For grains, quinoa, grilled whole grain bread, brown rice, or sweet potatoes add both flavor and texture. When preparing any meal or snack, you need to find balance. Salty should counter sweet, while crunchiness should juxtapose softness. That’s why we love adding Super-seed Sprinkles to just about any bowl of greens. Salted pumpkin seeds, sunflower seeds, cashews and cranberries add just the right amount of, well, everything. We also love to add in goat cheese, feta, or vegan cheese. Have a favourite go-to salad combo? 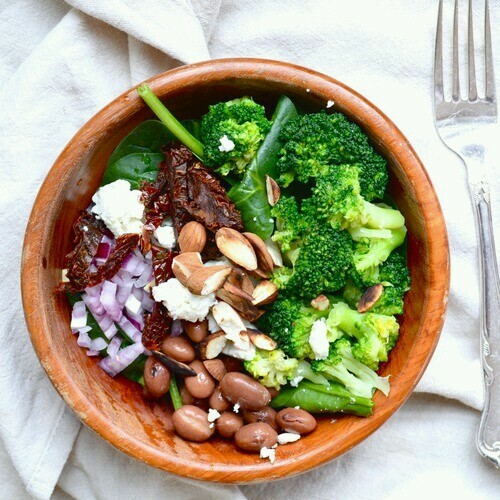 Tag us in your latest bowl of greens on Instagram. We’d love to see your creation!